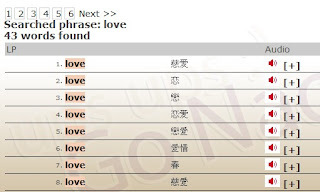 Recently, I found a website Gonaomi that called itself biggest online dictionary. I was surprising it offers about 30 different dictionaries that cross many languages that included English, Chinese, Arabic, Japanese, Russian, Tagalog, French, Czech, Irish, Italian, Spanish, Dutch, Finnish, Portuguese, Slovak, and other. This website based on Poland, that why I was so surprising, I knew many different dictionaries which cross several languages but no any one from Poland. I thought maybe that is web 2.0 site and mashed up lots of dictionaries. After I try Gonaomi, I used English/Chinese and English/Japanese dictionary, it lets me shock. I have never see this kind of dictionary before, it was terrible! I used English/Japanese dictionary, type in Japan, the result was nothing. 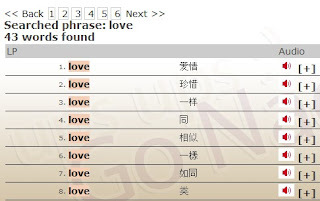 I also used English/Chinese dictionary, type in Love, the result was a little bit better: several words are right but number seven that translated Love = Spring in Chinese, after that rest results I have no idea what it did. Several results say Love = Same. I do not know about other language, I do not think that is a reliable dictionary. Maybe this is a biggest online dictionary, but also a worst dictionary.